While we may be geeks, nerds, and dorks, we are still professionals. We need to carry ourselves with a certain amount of confidence that says, “I know what I’m doing” (even if you haven’t got a clue). This is normally achieved by wearing clean clothes that aren’t solely ironic t-shirts and jeans, and keeping our gadgets and gizmos organized. Some prefer backpacks, others prefer messenger bags, but nothing says ‘professional’ like a briefcase. Of course, given the amount of items we need to carry, it can’t just be any old thing. The Laptop Bag from Normincies doesn’t have a name besides ‘laptop bag’ because it is wholly and simply that. This is a leather bag that can either go in messenger bag or briefcase mode depending on your situation. 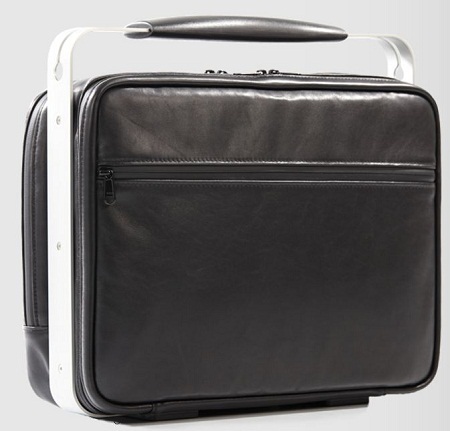 It has room for your laptop, phone, business cards, an external HDD, mouse, USB sticks, a tablet, and much more. It has an elastic handle with an aluminum frame, water-repellant zippers, and can hold either a 13 or 15” laptop. There are only classic colors of black, light brown, and dark brown leather to choose from. They range in price from $650-670 for those of you that are interested. This is definitely a bit more refined than necessary, but if you have the money to toss at it why not, right? As it is made of leather, you’ll want to make sure you take proper care of it so it doesn’t last as long as any mass-produced backpack would.